This post has been almost 3 months in the making: at the end of 2018 my partner in life and in art Iker Spozio and myself decided to leave San Sebastián, meaning I’ve had to leave the space I rented for 8 and a half years to make music, a ground-level former olive and pepper brinery. My music has evolved along with the spaces where I’ve lived and worked, and for the past 3 months my mind has been filled with reflections on the very peculiar necessities that come with being an artist – or a maker of any kind indeed – and the even more specific problematics of musicians. I initially wanted to illustrate this post with a picture of the completely empty studio once the removal men had come and taken everything, or one of the pictures I took while the boxes were piling up, but I lost both sets of photographs – an indication of how mentally intense the whole process was, and how times of personal change are not times to communicate, but to get things done. 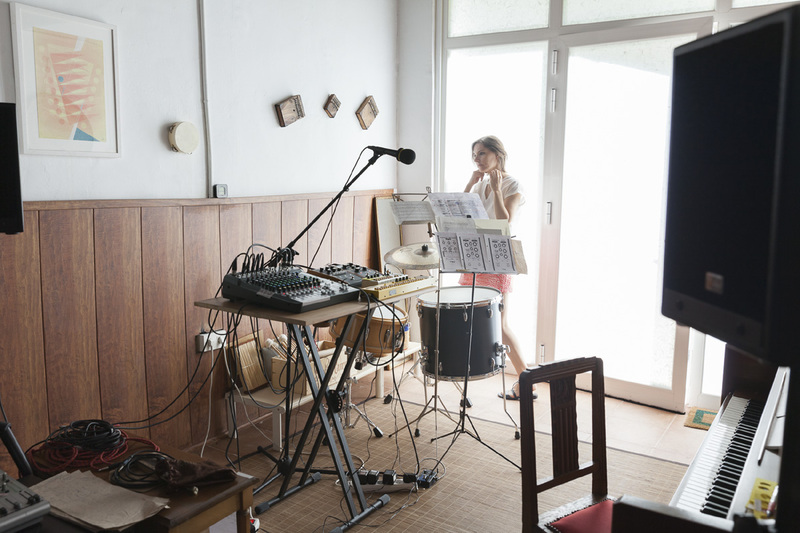 So instead I’m sharing again my favourite picture of the studio, taken by Isabel Dublang for the Resident Advisor Machine Love feature about my music published in 2017, one of the many photos that will remain as mementos of a space that was very dear to me and fundamental in the evolution of my sound over my 4th, 5th and 6th albums. The challenge presented by leaving a 40 m2 space (21 m2 of ground floor where the music got done + 19 m2 of storage space in a mezzanine space upstairs) and selecting the gear and objects that could fit into a 14 m2 space within a flat (*not* a studio space separate from my new home) was very real, turning those couple of January weeks into a time of taking stock not only of what I had physically accumulated over the past 8 and a half years in that space (plus everything musical that I’ve bought since the age of 15 – a 27-year-period all in all! ), but also stock of how much I’ve changed as a musician, and how my needs are no longer the same. Indeed – and I will deal with this in future posts – it is in great part the very evolution of my needs and desires that has permitted me to contemplate going back to a home-studio-style setup. So I would like to take the opportunity of this big life change to write about a subject that’s seldom approached and that seems to me even more crucial to explore in a time of real estate madness: how to make your space work for your needs, no matter what your circumstances are. In particular I’d like to talk about the home studio vs outside-of-the-home studio, the pros and cons of each according to my own (of course very subjective) experience. More soon! « REFLECTIONS ON THE SPACE NEEDED BY MAKERS, PART II: HOME STUDIO VS OUTSIDE-OF-THE-HOME STUDIO, MY PARIS EXPERIENCE AND THE LIMITS OF WORKING FROM HOME IN A NON-DEDICATED SPACE. You are currently reading REFLECTIONS ON THE SPACE NEEDED BY MAKERS, PART I: LEAVING SAN SEBASTIAN AND MY MUSIC STUDIO, OR THE CHAOS OF HAVING TO DOWNSIZE 27 YEARS OF MUSIC-MAKING. at colleen.